The mission of the Black Rock Arts Foundation is to support and promote community-based interactive art and civic participation. For our pur poses, interactive art means art that generates social participation. The process whereby this art is created, the means by which it is displayed and the character of the work itself should inspire immediate actions that connect people to one another in a larger communal context. 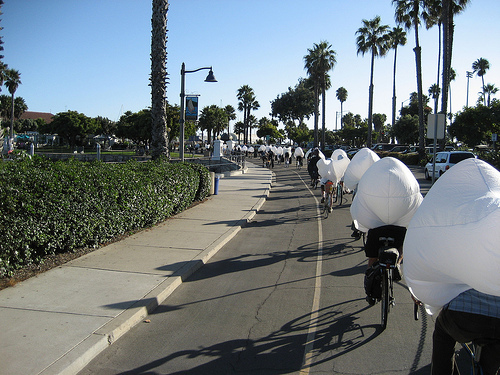 And that’s why I applied for a Black Rock Arts Foundation grant to fund the 2010 ArtRides, and especially the Aeolian Ride (LA’s 2005 Night Ride is pictured)–because I think we meet the BRAF mission. What are the ArtRides? What’s an Aeolian Ride? On the First Friday of each month from 5:30pm-8pm, 25-50 of us travel on bikes to various art galleries and studios during First Friday Gallery Night sponsored by local galleries and studios. A typical ArtRide meets at 5:30pm at the Artists Union Gallery, located at 330 S. California Street on the Ventura Beach Promenade. About 6pm, we ride along the beach bike path and through the downtown, midtown, and westside areas of Ventura stopping at various galleries and studios. 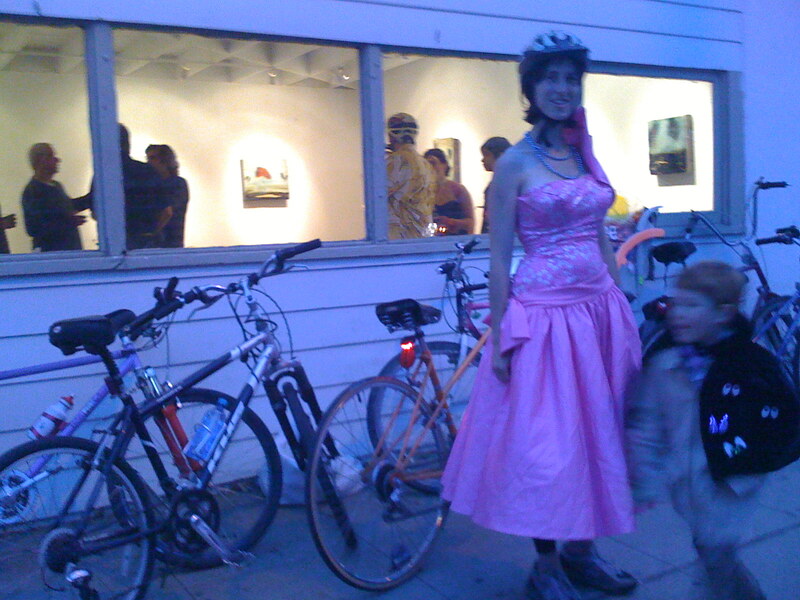 Here’s Harmony, my small boy, and many bikes outside a gallery during the prom ride last May. Each ride has a different artistic theme for ArtRiders to participate in with costumes and bike décor. 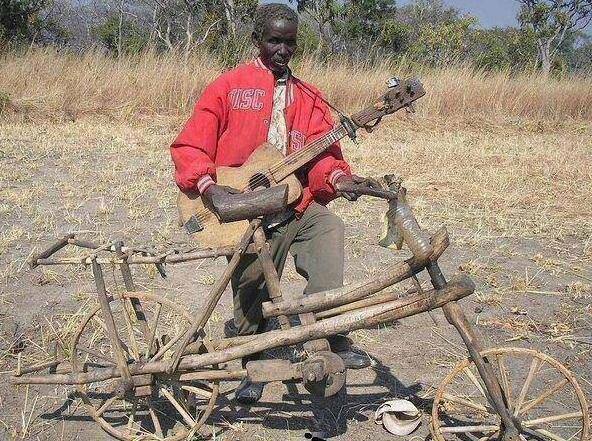 Some of us make music as we ride; we wave and smile and interact with those we pass. We lead a monthly weekend daytime as well which follows the same theme. Here’s a list of 2009’s ArtRide themes. If you have suggestions for 2010, bring ’em on! Especially if you’re into helping out with making flyers etc! ArtRides range in size from 25-50 people; with ArtRiders joining us along the way and falling off when they n eed to. ArtRiders range in age from infants to teens to college grads to seniors. Many families ride with us; we encourage family participation and we anticipate and support the needs of families as best we can. Children under 8 must ride with a parent in a bike seat, in a trailer, or on a trailabike. In October 2009, my then 5 year old son and I went on an Aeolian Ride in Santa Barbara; I knew right then and there that we had to do one in Ventura! In 2010, we plan to hold two Aeolian Rides under the leadership of Jessica Findley, who received a BRAF grant in 2004 to construct the original costumes and lead the original Aeolian Ride in NYC. 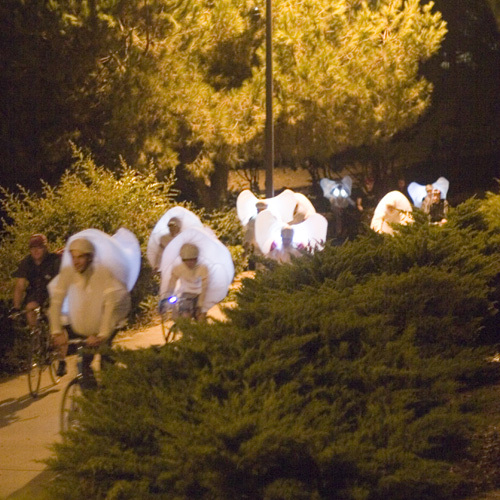 We intend to hold one ride at night (like in LA in 2005 pictured) and one during the day (see photo s of the Santa Barbara ride–yep, that’s me, AP in the hot pink hair riding the Tiger bike!) 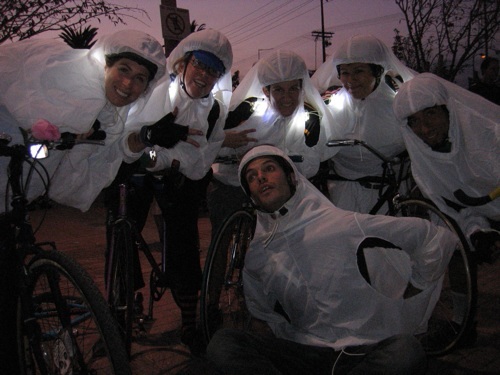 For the one at night, we plan to rig the costumes (and bikes) with lights. In order to figure this out in advance of the ride and Jessica’s arrival, we will also construct additional costumes using Jessica’s patterns. She has a grant to make children’s costumes and so we will make children’s sized ones as well as adult sized ones. We hope to hold the Aeolian Rides August 6 and 7 because August 7 is the Ventura County Fair Parade. 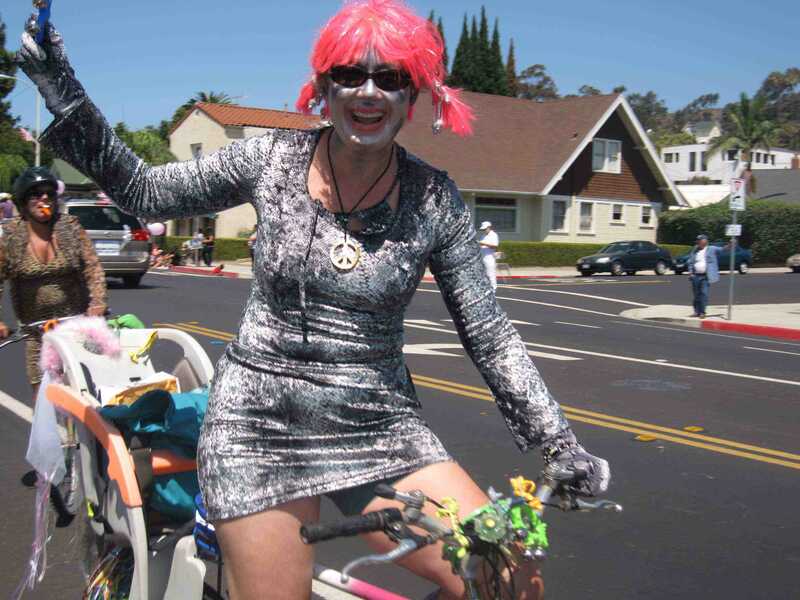 Last year, we were in the Parade as animals on bikes playing kazoos and singing the song “We went to the Animal Fair.” Yes, that’s me, Art Predator again in that wild hot pink wig! Several people said we were their favorite entry because we were so interactive with the crowd and could move around the street and get closer. I am sure an Aeolian Ride would be a HUGE hit with the crowds which line the fair parade route. We might even be able to ride right into the fair grounds and ride there as an attraction! As other communities are also getting on the “First Friday” Bandwagon, we will seek them out and encourage the development of s imilar rides. Already, a Santa Barbara ride has changed its timing to correspond with their art communities “First Thursday” event and friends in Flagstaff are interested in getting a ride going during their First Friday event. Anyone can join the ArtRide who has a bike and the safety features required by law. We strongly encourage people to dress up according to the theme. We help them figure out what to wear and we hold bike workshops too. We’d like to do more to help get people and bikes together. Jessica has 52 costumes, plus the new children’s costumes, plus we will make a few more. We intend to have a rider for every costume. When we make our Friday night gallery stops, we talk about the art we’ve seen. We promote cycling and having fun, getting out and participating in life. Anyone who wants to joins the ride can participate in the fun. The audience is the community at large—those we ride by and those who are attending First Friday events as well as the artists. Thousands of people line the streets for the annual Ventura County Fair Parade. It is also possible we could ride at the fair. 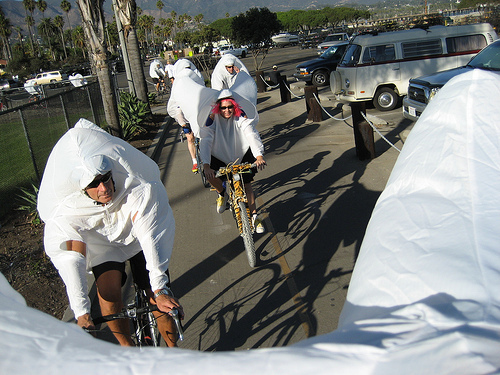 The ArtRides are a collaboration with the participating First Friday Galleries & Studios, VCCOOL (a climate change activism group), Ventura Bicyclists Union, and more. Local bike shops are very supportive and help publicize the rides. Many artists in town ride with us or contact us about making a stop at particular shows; several artists have collaborated on posters and flyers. We will collaborate also with Jessica Findley for our Aeolian Ride. This is our second year of doing ArtRides. Our next First Friday ArtRide is the Feb. 5 “Tweed Ride” followed by a daytime ArtRide: Feb. 6 “Tweed Ride 2: Saints and Angels and the 7 Deadly Sins” where we will ride and then participate that evening in a AIDS benefit Fashion Show by riding our bikes down the catwalk in costume. More on those rides soon!